KNIGHTSTOWN, Ind. 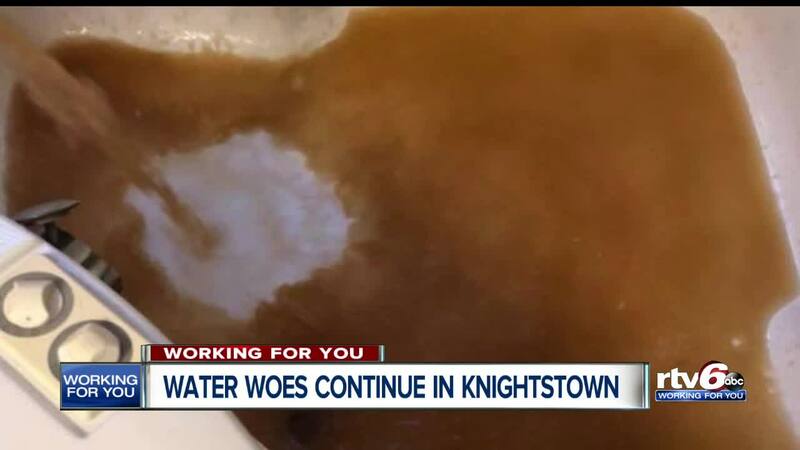 -- More than a month after Knightstown officials said brown water would soon be fixed, residents still see it in their homes. Ashlee Wright went to fill her bathtub Monday morning, but brown water came out. "I mean, it's disgusting," she said. Simple tasks like cooking, cleaning, and dishwashing have all been complicated by concerns for the health and safety for her family. Her family has been drinking and cooking with bottled water. She said she's called the utility office repeatedly, only to be told their working on it. The Town of Knightstown said it is regularly testing the water, finding it safe and contaminant-free. "Clothes are getting ruined," Wright said. "My daughter's baby clothes are getting ruined. We're not drinking it. We're trying not to bathe in it." It's been more than a month since the Knightstown Water Department said it was repairing the filtration system, with plans to have it done a week later. On June 29, the utility said it discovered large parts of the system needing replacement. On Friday, it announced the new filters were getting installed. The town said it plans to start using the new filters by Wednesday. But in the meantime, Wright and other customers say Knightstown owes them money after months of getting billed for brown water. "I don't know if there's a way that everyone can be reimbursed for paying every month," Wright said. "Because, since it's the worst it's ever been now after months of already dealing with it, I just feel like this month I really don't want to pay my water bill." The utility has not immediately responded to RTV6's request for comment.